Specially designed for the classroom, the Crystal Productions Color Wheel Poster provides a unique reference for color concepts. The inner wheel rotates to identify and define major color schemes, such as analogous, complementary, and triadic schemes. Fine art reproductions are displayed around the wheel to demonstrate how master artists used different color palettes. 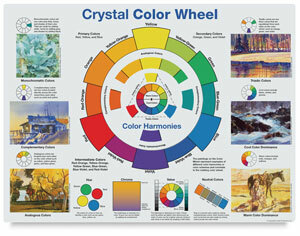 The Crystal Productions Color Wheel Poster is printed on durable, laminated card stock for many years of use.